Their Take: This is kinda cool and different. Check out the video below that Unibroue made on the beer to see what they’re saying about La Fin du Monde. Well, this one’s been sitting neglected in the draft bin for quite some time. I’ve been meaning to write this beer up for a while, having drank it back on apocalypse day. I picked this one up specifically for that day, as the beer’s name means The End of the World, making it wholly appropriate. I wasn’t particularly a fan of Belgians prior, but with the reputation of this particular beer, I figured I’d give it a shot. I’m glad I did. 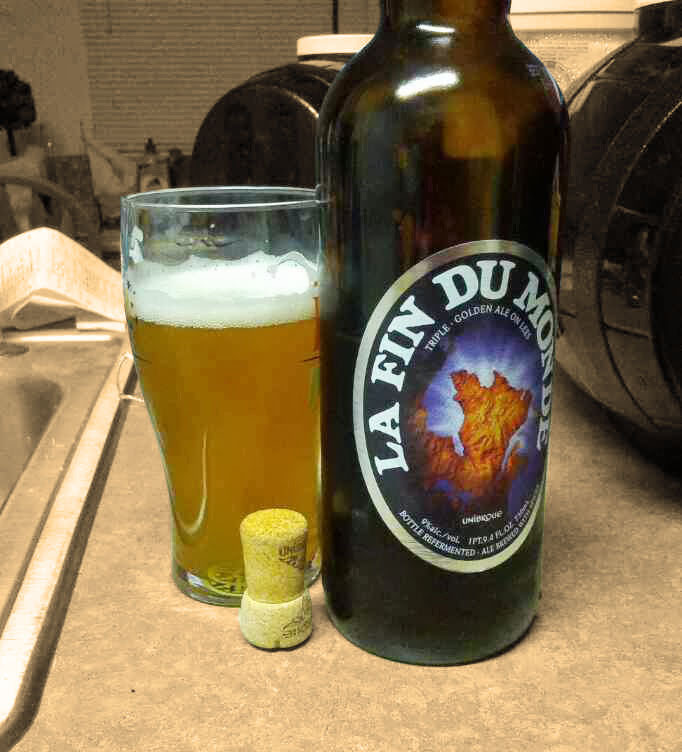 La Fin Du Monde is a heavily carbonated beer that pours a very nice pale golden color. Its got a very citrusy aroma, specifically lemon off the bat with a hint of that Belgian banana. The taste is very light, especially for the ABV it hits. Malty up front, finishing up with banana flavors at the end with just a hint of alcohol which in this case I found to complement the overall taste. It drinks much lighter than a 9% beer, and is absolutely delicious. This beer really changed my mind on the Belgian style, and after trying this one I started to seek out others of the style and it has become one of my favorite types of beer. I’ll always be grateful of this beer for opening my eyes and palate up to appreciating a different style. This entry was posted on June 15, 2013 by dasalehaus in Brew Review and tagged apocalypse, beer review, belgian, craft beer, la fin du monde, unibroue.